As Christmas approaches, beauty lovers wish-lists start growing, and who can blame us, there are so many wonderful offerings at this time of year. So I thought I'd share mine with you today! This eye palette is perfect for winter, with the darker shades, the matte shadows and the gorgeous neutrals it's a great all rounder. While I still absolutely love my Naked 2 palette I think that the Narsissist palette is very versatile and while it may put a dent in your purse, it's worth it! Not only does this set looking amazing, but it includes some brilliant brushes too! The 227 Soft Definer brush is a perfect dupe for Macs 217 brush and the 102 Silk Finish brush is perfect for applying foundation and gives an amazing finish. The set also comes with a brush clutch for carrying your brushes. When it comes to nail polish in winter, burgundy, navy and gold are my favourite colours to wear. This nail polish by Essie is the perfect shade for this time of year and darker nail colours actually make your nails appear longer! Ever since this brow product first got lots of attention I've been dying to try it out. I've seen lots of people on Instagram with amazing brows and they rave about the DipBrow Pomade. For me personally my hair is always darker around Christmas so a strong brow is a must! I love a dark lip for winter and this lipstick looks like a gift from the gods! A friend of mine recently bought this and rates it highly. Some matte lipsticks can be drying on the lips and don't look the best but this lipstick is creamy perfection! I definitely think I'll be splurging on this soon. 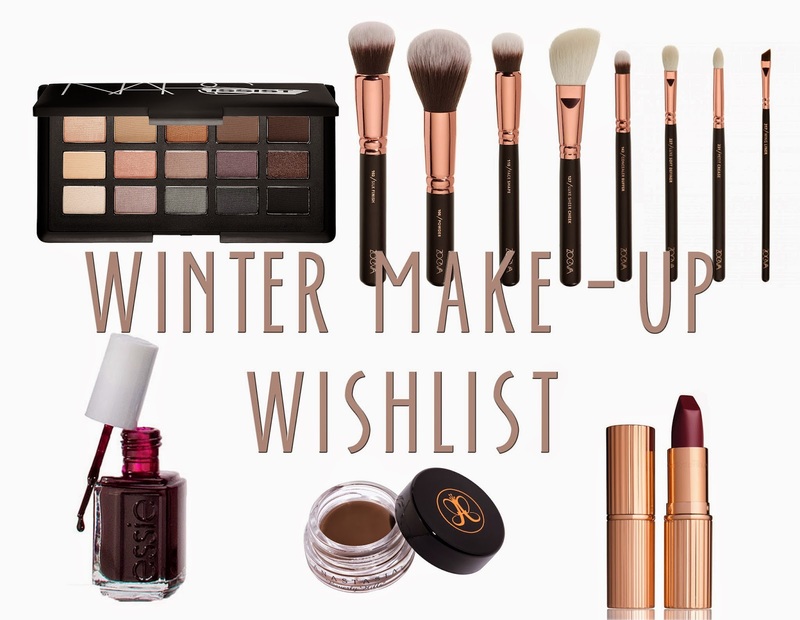 What's on your winter make-up wish list this year? Let me know in the comments!